Who wouldn’t like to spend an afternoon wandering a lush green orchard learning where food really comes from? Top it off with a tractor ride, a little playground time and ice cream–and you’ve got a trip to Eckert’s. Visiting Eckert’s is practically a childhood rite of passage in St. Louis! Eckert’s pick your own fruit season starts in May with strawberries and goes straight to fall when you can pick your own pumpkin. They also have a pick your own Christmas tree area, but it’s a stretch to call a 10-foot pine a “fruit”. You can also come out for blackberries, blueberries, peaches and apples. Just check out their ripening schedule for the full calendar. I’ve taken the kids out to Eckert’s for strawberries, peaches, apples and pumpkins. Apples might be the best fruit to pick out there, mainly because apples have a long shelf life and can hang around the kitchen for a while. Peaches, on the other hand, demand immediate attention or they turn into a gooey mess. Most kids really enjoy picking their own fruit right off the tree (or bush if you’re out for berries). This might be some kid’s only chance to see where food comes from and that it doesn’t just magically appear at the grocery store. You can spend the whole day at Eckert’s in Belleville, which is their largest complex. They also have smaller farms in Grafton and Millstadt. Belleville has a garden center, restaurant, frozen custard stand and a country store where you can shop for local produce, meat and bakery goods. We’ve come for the fruit picking and left with a couple cookies and sack full of produce from the shop. 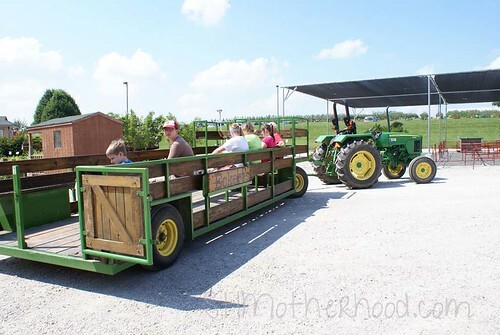 Some kids will think the best part of visiting Eckert’s is the wagon ride out to the orchards. They will drop you off in an area ready for picking and come back for you after you’ve had time to explore. The fruit trees have plenty of low hanging branches for easy picking. Even little kids will have no problem finding fruit to pick. They don’t mind if you do a little sampling, so go ahead and try the fruit while you’re in the orchard. 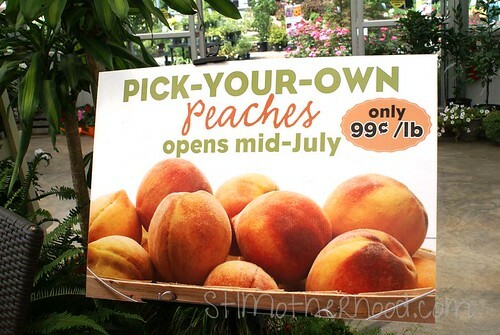 You’ll be amazed at how much better fresh picked fruit is compared to what ends up in your grocery store! Do keep in mind that fruit is sold by the pound, so though it’s tempting to fill several bags or boxes you might want to keep an eye on the weight. Pick your own fruit is normally a lot cheaper than most grocery stores, but it can add up fast when the fruit is so fun to pick. It’s extremely important to check the Harvest Hotline on line or at 618-233-0513 before you go! Sometimes Eckert’s is forced to close the orchard due to weather or crop conditions. The Harvest Hotline also has pricing information. For directions to the Belleville Farm, click here. If you don’t have time to visit the pick-your-own farm, Eckert’s has a St. Louis Farm Market in Sappington at 11520 Gravois Road, not farm from Grant’s Farm. It’s only open a short time during peak season, so hurry!